The former warehouse of the Ashdown Hardware Co. and later purchased by Lewis Stationary Ltd. in the 1970s; Lewis Lofts can indulge your desire to own a piece of history. Wonderful features of this space include hand-scraped hickory hardwood flooring, 10' high wood slat ceilings, fir beams/columns, two exterior red brick walls, corner gas fireplace, an east facing balcony, insuite laundry, additional storage and an underground parking stall. 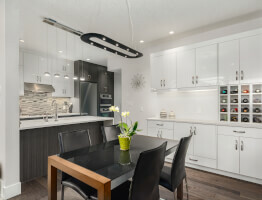 The kitchen blends stainless steel appliances with flat panel cabinetry and stainless steel countertops. The bedroom is currently located in the cozy NE corner with perfect views of the Calgary skyline and great positioning near the stylish 4 piece bathroom. 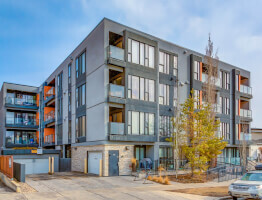 Lewis Lofts is situated in Victoria Park, a neighbourhood that boasts an endless array of restaurants, pubs, shopping and culture; equating to a walk score of 100.